ENERGY STAR® qualified windows, doors and skylights will save you money by reducing your energy costs up to 12 percent. Not only that, they'll help keep your home comfortable all year-round, reduce outside noise, and, depending on the amount of humidity in your home, will have a lot less condensation in cold weather. 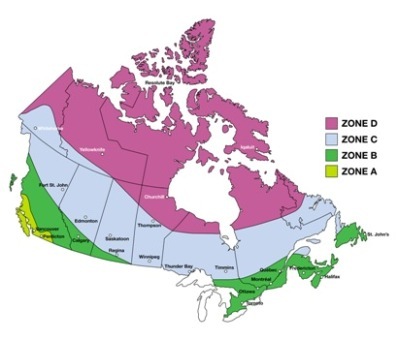 Canada has been divided into four climate zones. The climate zones for which a window,	door or skylight is ENERGY STAR qualified will be shown on a label or on its sales literature. Simply choose a product model that is qualified for the climate zone that you live in. If all of the original windows and doors in an average older home were replaced by ENERGY STAR qualified windows and doors, the household energy consumption would be reduced by about 7 percent, which would save three quarters of a tonne of greenhouse gas emissions annually. If ENERGY STAR qualified windows, doors and skylights where installed in an average new home instead of conventional products, energy consumption would be reduced by about 12 percent. Many products will qualify for more than one zone in Canada. The more zones a product qualifies for, the more energy efficient it is. So, if you buy a product that is qualified for one or more zones that are colder than where you live, you can save even more on your energy costs.